Technology is advancing more rapidly today than at any other time in human history. Amid the ever-growing market of new technologies, one capability -- cognitive computing -- is expected to be revolutionary for multiple industries and, indeed, society in general. For government in particular, the timing for a game changer couldn’t be better. Multiple disruptive forces are complicating the missions and operations of – and creating significant challenges for -- government organizations globally. Cognitive-based systems can build knowledge, understand natural language and provide confidence-weighted responses. And these systems can quickly find the proverbial needle in a haystack, identifying new patterns and insights — something particularly relevant in complex government information environments. 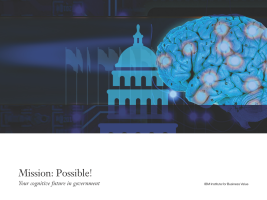 Download this report as it examines current and future applications across various government mission areas and provide recommendations for those seeking a cognitive journey. It also offers insights from government leaders who understand how cognitive capabilities can help push the current boundaries of innovation and transformation in government organizations. These leaders recognize the potential to transform government — and are set to exploit cognitive capabilities to do so.